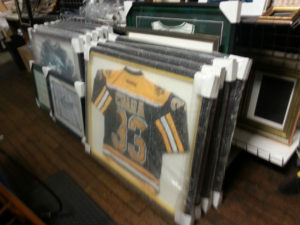 Framed In Time offers art & framing services specifically tailored for businesses large and small. We understand and meet the needs of our corporate clients with convenient on-site services, value-based budgets, and fast turnaround. We will work with our clients to put together a package that meets not only their design needs, but also their budget goals. Let us come to your office with assistance in custom framing design, art acquisition, delivery, and installation. Please Contact Us for custom quotes on quantity jobs, specialty work, or consultation. We have 30 years worth of references and enjoy nurturing new relationships. “Recently, we had an event that needed 15 sports jerseys, and four photographs framed in a matter of three days on the week of Thanksgiving. John from Framed in Time not only got us all of our items in time for the event,​but they looked absolutely amazing! ​You can tell each piece was well thought out with the best attention to detail I’ve ever seen. For example, we had a golf scorecard that was a part of our auction that needed framing and John took the time to frame it with turf to give the piece​an extra edge and incredible detail. Even with a seemingly impossible task given to them, Framed in Time gave us an overwhelmingly positive experience with extraordinary results”. We recently framed 25 oil portraits of past presidents from Boston College. Framed in Time was carefully selected to handle this very important project, which featured oil paintings up to 150 years old. Special attention was given to all aspects of framing, storing and delivering these portraits over a nine month period. These pictures show the history, perseverance, people and stories of this great institution. 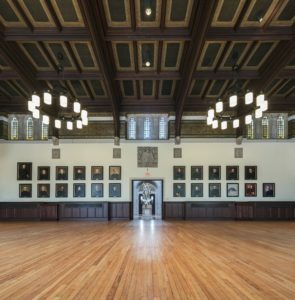 They are installed in Gasson Hall.